An introduction for Guests and New Crew - PART 2 - How Sails Work - And More.. . . Click here to open full in new window. First, 90 seconds of relaxation. - A video from on board - Select full screen. Now, let's work! - 2nd. Session - Introducing The Art of Sailing - How Sails Work - (and how to make them work better?).. Many expert sailors will emphatically tell you a sail works because it is an aerofoil, like an aircraft wing. Others take an alternative scientific perspective, involving Newton's Laws and such. A fine explanation of this is at PhysicsBuzz.com. For more detail see this technical article. If they numb your brain, skip them. 3) Are set at the best angle to the (often changing) wind. - What's "best"? - We'll come to that later.. 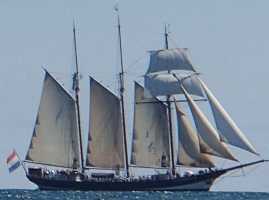 Many years ago, sailing ships were "square rigged". The sails hung from Yard Arms which were rigged more or less across the ship. They could sail pretty well in a following wind, became less effective when the wind was from the side, and were near hopeless if it was even slightly in front of them. 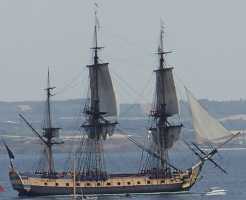 Later, ships had sails which could be set fore-and-aft along the centre-line. These enabled them to sail well in a side wind, and even if the wind was somewhat in front of them, though not head-on. Even today, the most technical sailing boats cannot sail straight into the wind. So what directions can WE sail in? And why? First, we'd better know about The Centre-Plate. 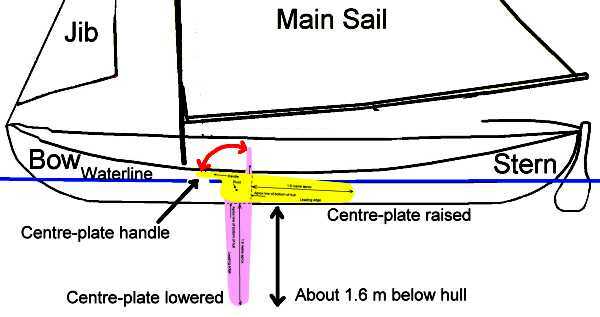 It is a flat plate, mounted on the centre-line of the boat, almost halfway back from the bow. Like the keel of a yacht, it serves as a fin, partly to keep the boat running in a straight line, but mainly to resist the sideways force of a wind from the side. Unlike a yacht, whose keel is heavy, Molly's Centre-Plate, in common with most sailing dingeys, is quite light. Also, unlike a yacht's keel, it is pivoted so it can be swiveled down below the hull, or brought back up within the hull. Molly, bird's-eye view showing the case/housing where "The Plate" is located. Molly viewed from the port side, showing the Centre-Plate swivels down and up. We'll start with simple scenarios, then build on them. The explanations avoid heavy technicalities and aerodynamics. The diagrams are basic to avoid confusion. Many of the diagrams below to be made more crisp + minor corrections. Suppose the wind is coming from Molly's port side, and we allow the main sail to flap aimlessly. It will flutter in the wind, much like a flag, and will not produce any forward drive. If we haul-in the main sheet (attached to the boom and thus to the Main Sail), the sail is brought in and catches the wind.. The wind striking the port side of the sail makes it billow out to starboard in a gentle (aerofoil shaped?) curve. This deflects the wind aft. By-passing Newton's Laws, Bernoulli, Colander, and other physics, here's an easy way to consider some of the forces occurring. (If you want the more complex physics, go back to the technical bit near the top of the page). You'll understand that the wind striking the sail from the port side, is being deflected aft, and creates a force on the sail. The force on the sail is represented in direction and strength by the red line, "pulling on the sail". There is therefore a force on the centre plate, represented in direction and strength by the Lilac line, "pushing on the centre-plate". The triangle (drawn on the lower left of the main diagram) represents the combination of these forces. Thus we see that the combination of the (Red) force on the sail, and the (Lilac) force on the Centre-plate, results in an overall forward force on the boat. It is this that pushes the boat forward. Conclusion from the above - When the wind is from the side - Set the sails out a bit, and the boat is pushed forward. We have totally ignored several effects, like the forces on the Rudder and the Jib. Later, we will consider these, and how to set the sail for optimum efficiency. What happens if we decide to take a slight turn to port? - Or the direction of the wind changes? Suppose the wind is no longer coming from the port side but from Port Bow. Here is the previous diagram, but showing the new wind direction. If we make no adjustments to the sail, the leading edge of it (just behind the mast) is in line with the incoming wind, so it behaves like a flag, and begins to flutter. This creates no drive. The rear edge of the sail is still catching a little wind, and remains slightly curved, but the wind flowing off the trailing edge has hardly been defelcted at all, so very little thrust is generated. The boat will soon slow down unless we do something. What can we do?. Adjust the angle of the sail! How? . Haul in the main sheet. Why? . So the sail can again "catch the wind". Here we see that by hauling-in the Main Sheet, the Boom has brought the Main Sail more in line with the axis of the boat. The leading edge of the sail is no longer fluttering. The smooth curve of the sail has been re-esablished. The wind flows smoothly all the way along it, and has been deflected thus creating a force on the sail. Conclusion from the above - When the leading edge of the sail begins to flutter - Haul-in on the sheet till the fluttering stops, and the sail will begin to drive again..
What happens if we want to turn even further to port? - Or the direction of the wind changes some more? Suppose, as a result of our wish to turn further to port, or a further change in the wind direction, the wind is no longer coming at us from Port Bow but from further forward. Here is the previous diagram, but showing the new wind direction (from further forward than before). Oh-Oh! - The leading edge of the sail is fluttering again, and creating no drive. - Why? - Because it is more or less in line with the incoming wind. The rear edge is catching a little wind, but the deflection of the wind is minimal, so the small amount of drive is over-whealmed by the effect of the wind blowing backwards on all the structure of the boat, (and the crew)! Consequence? - The boat is stalled, slows to a halt, and will soon be drifing backwards. Should we haul-in the Main-Sheet like before? You could try, but unfortunately it won't help, because although the sail might fill, it would only serve to drive the boat backwards (and somewhat to starboard). Conclusion from this? - If the wind is from too far forward, the sail will not drive us forward. The limiting angle is about 45 degrees. It is much the same for all sailing boats. We've seen situations when the winf is from the side, and from as much as 45 degress forward. What abouit if the wind comes from somewhat behind, or dead aft?. Summary - What directions can we sail in? Basic sail trimming for efficiency. To be finished another day! More "Re-Hydration" - (Premature consumption can lead to erroneous navigation). < Back to 1st session.